By the way, both the older man and young man belong to Y-hg R1a. Can you do a Globe10 output for them ? (you basically only have the Haak et al's I0ss. on yr sheet . I'd like to have a tinker and forward an explanation. BTW U5b in 3000s BC isn't 'western European'. A real person with one Steppe parent and one MN parent! That's amazing. Where does he cluster? Hungary, YugoSlavia? He's perfect for demonstrating that European diversity is largely determined by proportions of MN and Steppe ancestry. Examples of grave sites where admixture between divergent populations happened are the best prove you can get of where haplogroups come from. The pure bred Corded Ware individuals in his grave had U4 and J1b1a1, both already suspected to be Steppe mtDNA haplogroups. I can't get accurate Global 10 coordinates for these three. Not enough markers. Not really enough information yet to be sure. My guess is that the older fellow was born elsewhere but was of local stock. Mother travelled out to the steppe, had a son and later the family (or the widow and kid/s) returned home to settle. As you say he is in the right spot on your plot to be half Yamnaya-esque and half Mediterranean/EEF/southern european. These folk were seen as far north as Scandinavia so a German enclave is not unreasonable. Mother travelled out to the steppe, had a son and later the family (or the widow and kid/s) returned home to settle. I think it'd hard to say what the variation represents. Not doubt there were different streams of invasions, some via southern Poland, others due north to the East Baltic. And the pattern of R1a sub-lineages is somewhat suggestive. But overall I don't think the overall genomic variation differentiates into a geographically or temporally meaningful way, at present. if the older guy is the non-local then non-local in which direction? did he come from the north, south, east or west? "The grave goods consisted of only a flint blade and a hammer-headed bone pin, laid down beside the older male. Such pins are rare in the CW of Central Europe, but common in the Pontic Steppe region where they occur in a variety of forms until they disappear around 2600 BC"
"As you say he is in the right spot on your plot to be half Yamnaya-esque and half Mediterranean/EEF/southern european. These folk were seen as far north as Scandinavia so a German enclave is not unreasonable." Southern Europeans aren't identical to EEF. Most are like 60% Anatolia Neolithicish at the most. They're mixed like everyone else, except Sardinians aren't that mixed. "The two other males could be the local progeny of more genetically northern girls and visiting tall Steppe men with fast carts! :)"
Northern girls in 3000 BC were like Gok2, EEF plus some WHG. Don't base things on modern populations. In the north I'd contend that there were groups like SHG, WHG and EHG longer (later) than we might expect. It is quite plausible that CWC not only mixed with Central European MNE, but also EHG/SHG and WHG. WHG yes, but I'm not seeing any evidence of SHG in any of the Bronze Age or modern populations. EHG was acquired on the steppe. In southern Sweden, Battle Axe and Pitted Ware people certainly met and traded, and Pitted Ware look like SHG with a tiny bit of EEF admix, don't they? But of course, any miscegenation this resulted in might have been too insignificant to leave any traces in later populations. 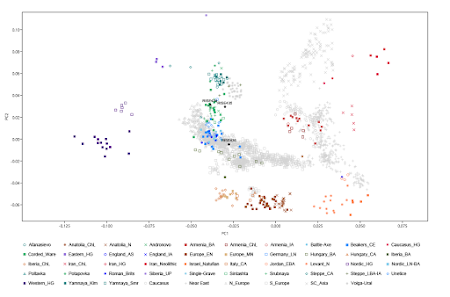 I don't know why, but on y-str.org, RISE436 has CT-CTS3662 and mt HG N.
Where an ancient child of biracial parents clusters in a PCA is where a biracial population who's a 50/50 mix should cluster in a PCA. Children of a biracial couple are the best way to determine if a modern population is also a 50/50 mix. Modern people in Corded Ware territory and a Bronze age German(with R1a) cluster further east and north than RISE436. Therefore they probably have more Steppe and WHG ancestry. They're probably not a simple 50/50 mix of Corded Ware and Middle Neolithic Europeans. IMO it increases significantly in Unetice"
If that was the case we don't see easily detectable traces of SHG in modern Scandinavians. And we know Scandinavians have Corded Ware ancestry because a Corded Ware Swede had R1a-Z284 which is at 20-30% in modern Scandinavians. Why did SHG not contribute gene flow to most modern northern Europeans while there is plenty of EHG/WHG? Have you heard of haplogroup I1 , or the Pitted ware culture ? wow. Those half breeds sure move astray in PCA?! What other half breeds should we think of? Using qpAdm and looking at all the stats, the best models for Unetice and Nordic_LN are with Yamnaya, LBK_EN and Hungary_HG or Loschbour. Motala_HG isn't necessary for the best fits. One or more of the Nordic_BA look like they might have some Motala_HG admix, but I'm not sure. Are you claiming RISE436 isn't of mixed origin? If so, how do you explain his grave goods, placement on the plot exactly between Yamnaya and early farmers, and mixed uniparental markers (R1a and U5b)? How do you know the I1 in modern Scandinavia comes from PWC and not from somewhere like the Carpathian Basin? But that would mean western Yamnaya / Proto CWC had I1 because there are no other archaeological movements to explain the appaearance of a carpathian group in Sweden. But then why the the lack of I1 in other western steppe derived areas of Europe. ? Hence it's likely from local Scandinavian Foragers (one of them was indeed pre-I1). So how did TRB get to Scandinavia? But even if modern Scandinavian I1 is from PWC, that says nothing about PWC genome-wide admixture in Bronze Age and modern Scandinavians, because most modern I1 derives from a severe recent bottleneck. 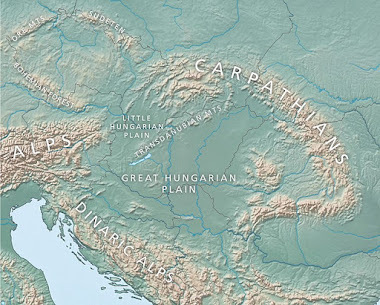 I1 was found in Early Neolihic Hungary. Right now the authors of the study who found him are getting his genome. I1, according to geneticker's work, has also been found in Mesolithic Sweden. "But that would mean western Yamnaya / Proto CWC had I1 because there are no other archaeological movements to explain the appaearance of a carpathian group in Sweden. But then why the the lack of I1 in other western steppe derived areas of Europe. ?" Just about everyone in Europe, including the Carpathian, has at least 3% I1. I1 need not have existed in proto CWC if Scandinavia's I1 is from MN farmers. It could have arrived in Scandinavia with Corded Ware who had lots of MN admixture or other heavily Steppe people who had lots of MN admixture. But the thing is all current I1 throughout Europe - especially southeastern Europe (incl Hungary, Serbia, etc) is nested within (derived from) north Europe. In other words, it's very likely to be from Gothic remnants, etc, not that LBK farmer in Nagy's study. Northern Europe is definitely the place of origin for modern I1, whether by Bronze Age founder effect from somewhere else, or local Mesolithic survival then expansion in Bronze Age. "Why did SHG not contribute gene flow to most modern northern Europeans while there is plenty of EHG/WHG?" If WHG and SHG were adapted to specific regions and evenly balanced in terms of pop. density and technology then there might not have been any reason for genes from any mixed marriages to spread and no way for either of them to physically displace each other. Whereas with EEF/EHG it seems there was a physical displacement of WHG territory (with substantial survival/revival). Doesn't seem like a puzzle to me if CWC folks are descended from the Yamnaya Culture.Here is a photo of the bone pin found in Germany:http://www.museum-digital.de/san/index.php?t=objekt&oges=11152. Also, an illustration of the bone pin found in Germany is in the book ANCIENT EUROPE A SURVEY (Piggott) page 84. Page 85 has a map of the distribution of Hammer-headed bone pins & derivative forms found in Europe.